50-State Agency Database Registry Launches Historical Materials, including a page for official records databases. Although there appears to have been no discussion of it in the world of archives (except for two comments on my post), the library community has had quite a bit to say about the LOC’s Working Group on the Future of Bibliographic Control report. If you have some time (maybe even you, David at The DIGITAL ARCHIVE), I’d suggest you take a look at some of their comments to get an idea what’s being proposed. They’ve even saved you time by tagging their posts with a groovy del.icio.us tag, “WoGroFuBiCo” – take a look here. The Zotero-IA alliance will create a “Zotero Commons” into which scholarly materials can be added simply via the Zotero client. Almost every scholar and researcher has documents that they have scanned (some of which are in the public domain), finding aids they have created, or bibliographies on topics of interest. Currently there is no easy way to share these; giving them a central home at the Internet Archive will archive them permanently (before they are lost on personal hard drives) and make them broadly available to others. We understand that not everyone will be willing to share everything (some may not be willing to share anything, even though almost every university commencement reminds graduates that they are joining a “community of scholars”), but we believe that the Commons will provide a good place for shareable materials to reside. The architectural historian with hundreds of photographs of buildings, the researcher who has scanned in old newspapers, and scholars who wish to publish materials in an open access environment will find this a helpful addition to Zotero and the Internet Archive. Some researchers may of course deposit materials only after finishing, say, a book project; what I have called “secondary scholarly materials” (e.g., bibliographies) will perhaps be more readily shared. 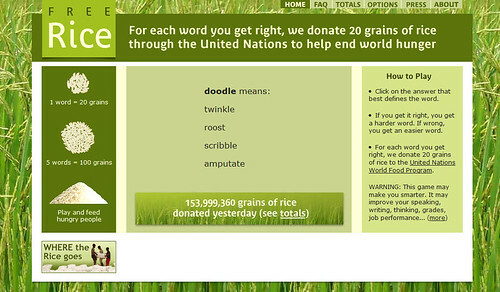 FreeRice has a custom database containing thousands of words at varying degrees of difficulty. There are words appropriate for people just learning English and words that will challenge the most scholarly professors. In between are thousands of words for students, business people, homemakers, doctors, truck drivers, retired people–everyone! I’ve tried this site–be careful–it’s addictive! But all for a good cause.